This was The First. My Number One. A total classic in imported Spruce and figured maple with Ebony fingerboard and appointments. Pre-Gibson Epiphone proportions 17" Lower Bout and 25" scale. Honey tinted, tap tuned, body with layered bindings and classic f-holes. Figured Maple three piece neck with standard truss rod and "fingernail" markers. All hardware including the Kent Armstrong humbucker is full floating. Only the Ebony bridge makes contact with the guitar's body. If you face the guitar's top or back and hum, it will hum back at you! Volume and tone controls under the pickguard. The essence of A full bodied Acoustic Archtop! In all PH archtops, nothing makes contact with the top except for the bridge. If you face the guitar's top or back and hum, it will hum back at you! Pre-Gibson Epiphone proportioned 17" Lower Bout. The x-braced top is honey tinted Sitka Spruce, while the highly figured Maple sides, back, and neck are caramel stained . 25" scale neck with ebony fingerboard, headstock overlay, and bridge with pearl "fingernail" inlays. Multi-Layered Bindings on body, f holes, and neck. Black Kent Armstrong floating humbucker with volume control under the pickguard. Vintage Guitar Magazine has included a beautiful review of this guitar by Pete Prown in their April 2017 issue. A copy can be found in the magazine reviews gallery on this site. A rear view to show the grain and color of the body as well as the neck details. 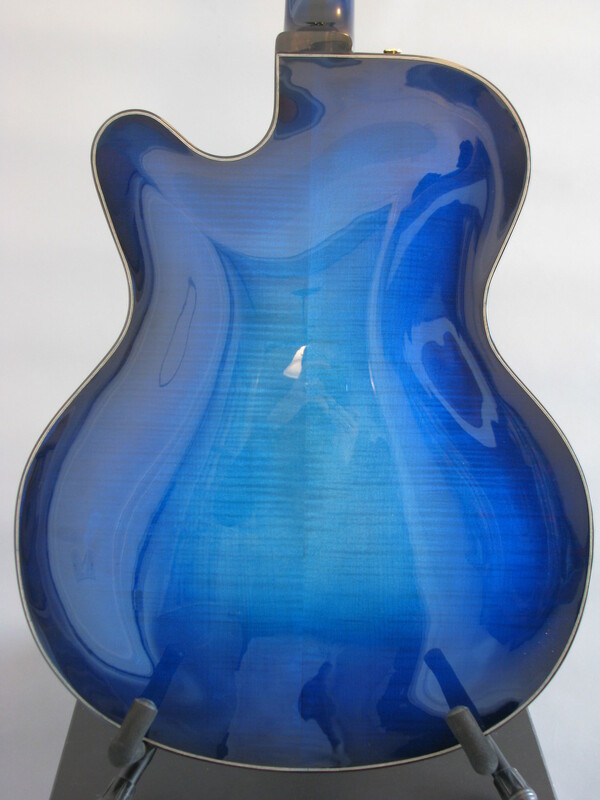 The Dutchess model in Cobalt Blue Burst finish with thin poly gloss coat. 25" scale. Imported Spruce, Highly Figured Maple, with Ebony details. Body is bound with Ebony and Maple, f holes and neck are also bound in multiple layers. Neck is three piece figured maple and mahogany with a two way truss rod, horn nut, and pearl "fingernail" markers. Sperzel Locking Tuners with Ebony buttons. Bartolini Floating Humbucker with volume control under the pickguard. This guitar was included in a builder's showcase review which you can see in the magazine reviews gallery. This picture can't begin to represent this finish properly. The actual perception of depth in the surface is so rich it seems like you could sink your hand into the wood up to your elbow. All PH Guitars finishing work is performed by Gerhard Guitar works. "Cue" Gerhard has been a professional finisher for nearly 50 years, and includes, among others, work as Brian Moore's custom finisher, Specter Basses, and Babiscz Guitars "factory " finishes in his extensive resume'. Options include nitro-celluolose lacquer and modern (thin) polyurethane finishes in satin or gloss. 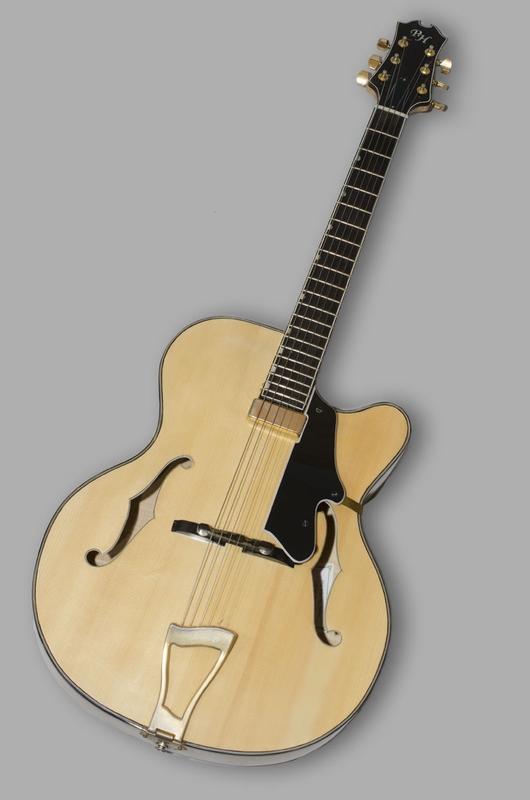 This powerful archtop guitar received a 4 Picks (Stars) rating in the November 2010 review in Premier Guitar. Here are links to the review and sound clips. Many thanks to Jason Shadrick and Premier guitar! Tap tuned Adirondack "Bear Claw" Red Spruce top, Highly Figured U.S. Red Maple back and sides in vintage cherry burst, bound in ebony and maple. Three piece, 25" scale flamed maple and mahogany neck, with a two way truss rod and water buffalo horn nut. The Howard Roberts "Fusion" style tailpiece allows dissonance in the instrument to be tuned out between the bridge and tailpiece. Sperzel Locking Tuners with ebony buttons. Bartolini Floating Humbucker with volume control under the pickguard. Details of this unique instrument show in this photo. The grain figure of the North East American Red Maple is stunning! This instrument was reviewed in the November 2010 issue of Premier Guitar, receiving 4 Picks (stars) by the reviewer.